HOUSTON, May 3, 2018 /PRNewswire/ -- Honeywell (NYSE: HON) today announced a handsfree, wearable Connected Plant technology that allows industrial workers to more safely, reliably and efficiently accomplish their tasks in the plant or the field. Honeywell's Skills Insight Intelligent Wearables feature a head-mounted visual display that responds to voice and brings live data, documents, work procedures, as well as health and safety information into view. The new wearable technology also connects field workers with remote experts in real time and allows them to assimilate valuable skills and knowledge while working. "This new Honeywell Connected Plant technology offers industrial workers the information they need when they need it, wherever they are," said Youssef Mestari, program director, Honeywell Connected Plant. "That means workers carry with them decades of relevant expertise that is accessible at any time by simple voice activation. This makes this solution a particularly good fit for industrial workers who have an affinity for technology and who need more physical freedom to efficiently accomplish their work." Honeywell's new technology uses the latest in handsfree mobile computing, augmented reality, Industrial Internet of Things (IIoT) and mobility software. It combines the RealWear HMT-1Z1™ handsfree wearable computer with Honeywell's Movilizer platform, an industry leading, cloud-based workflow solution, to support field service operations, specifically in hazardous locations. Operator task automation: Guided work instruction and procedures plus visualization of documents to facilitate field work. Visualization of live data: Real-time IIoT data made available to the field worker. Video capture and playback: Learning on demand and on site through playback of video, captured by expert operators working on similar tasks, searchable using voice. Expert on call: Instant access to remote experts via video chat, who can see what the field worker sees and can provide advice, share documents or annotate the video feed. Geo-localization, navigation and asset visualization: Locates a field operator in the plant and provides navigation and visualization as required for a task. Rapid emergency evacuation: Locates workers in the plant and guides them to an assembly point using geo-localization. Man-down assistance: Detects a man down, identifying the location and notifying the emergency team for assistance. "RealWear's 100 percent handsfree, rugged head-mounted computing platform is the world's first to achieve the Zone 1, Class 1/Division 1 level of intrinsically safe certification," said Sanjay Jhawar, co-founder and president of RealWear. "Together with Honeywell's software and services we enable digital transformation that drives higher productivity and safety for people working in hazardous locations and across the industrial sector." Honeywell Connected Plant is a suite of applications that delivers higher levels of safety, reliability, efficiency and profitability. These proven industry solutions are based on decades of domain knowledge and controls experience. They turn data into actionable insight so industrial manufacturers can optimize operations, predict plant failures and eliminate unplanned downtime. This new level of consistent high performance makes every day the best day of production. 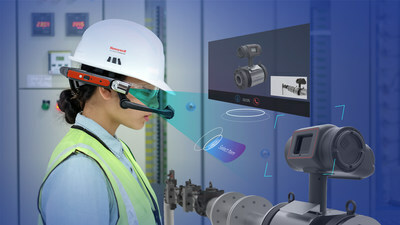 For more information about Skills Insight Intelligent Wearables, visit Honeywell Connected Plant.